Here are some of my favorite funsies for this month. Enjoy! These pillows are the perfect gift for new parents and would look great in any nursery. They hail from www.uncommongoods.com and are a convenient choice when you just don't want to give one more onesie. Since my brother-in-law and sister-in-law just found out they are having a girl, this gift is definitely on my radar - congrats Mark and Sara! These rain boots made by Hunter, which are perfect for summer rain showers, have been around since 1865. They are sturdy, reliable and were even mass produced for the British Army in World War I (not these exact ones per se). 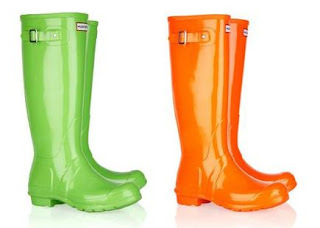 Their dependability has been proven and now with fun and funky colors, Hunter Boots are mixing form, function and fashion. Check out their website, or www.zappos.com, for different colors and styles. They offer men's and children's selections as well. 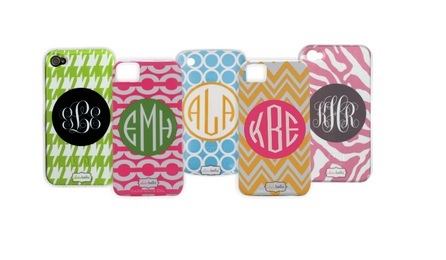 I love anything monogrammed or personalized and am obsessed with these adorable phone cases by Clairbella. Having just gotten a new phone I am so excited to order one...the only problem is picking out which combination of patterns and colors I like the best. The cases (which include a variety of different phone, Kindle and iPad options) are 100% personalizable and the sky is the limit when it comes to the design. To find an online store in which to get started (clairebella.com doesn't offer online shopping) click here. Have fun! 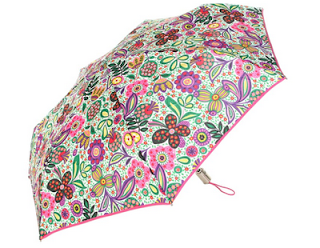 Need a great rain accessory to go with your Hunter Boots (above)? Try a happy, flowery Vera Bradley umbrella. The prints are colorful and will take a little bit of the hassle away from a rainy day. These also would make a great Mother's Day gift...hint, hint! It is no secret to any of my friends that I LOVE my canvas tote bag. I take it everywhere! It is huge, monogrammed and orange...just a few of my favorite things! 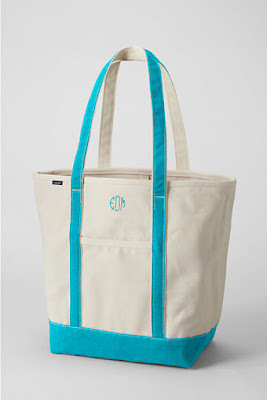 My personal boat and tote bag is from LL Bean and I would definitely recommend it, however I have heard rave reviews about this bag (very similar to mine) from Lands' End. Some of the perks that the LL Bean version lacks? Both companies offer many colors, patterns, customization and monogramming. One LL Bean perk? FREE SHIPPING with no minimum order and no end date! Woot woot.